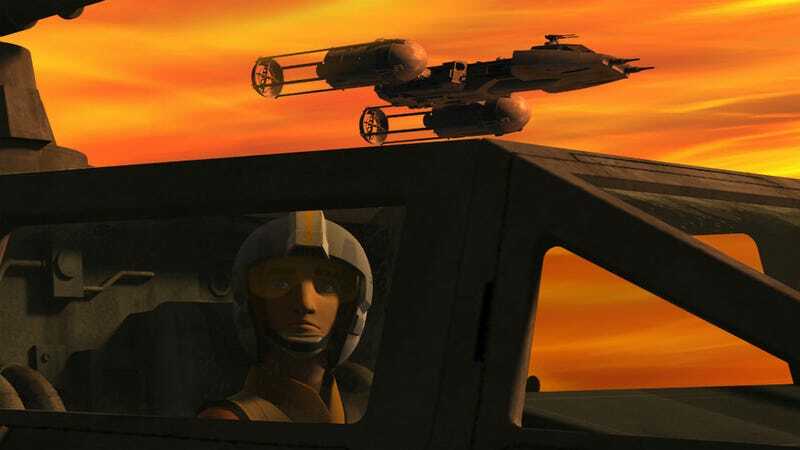 When Star Wars Rebels was first announced, we knew it was going to be about the formation of the Rebel Alliance. And it has been, but in a very roundabout way we didn’t quite expect. However this week’s episode finally—and literally—delivered on that original promise, and it was worth the wait. Obviously, prior to the clip, Mon Mothma has spoken out against Emperor Palpatine and that has made her a fugitive of the Empire. That’s pretty cool on its own. But there’s an even bigger moment later, a moment so key to everything that happens in the Star Wars universe I still sort of can’t believe it was on this episode of Rebels and not in a movie: Mon Mothma publicly withdraws from the Senate and announces the Rebellion exists, she’s in charge, and other systems chafing under the Empire’s tyranny can join. The episode cuts to all manner of characters on different planets watching this—and then the last image is of the Rebel Alliance finally coming together in the form of dozens of ships arriving at Mothma’s location (presumably Dantooine0. Obviously, this is part of the story Rebels has always meant to tell. Still, it was undeniably thrilling to see this landmark moment in Star Wars, no matter what the medium. It took a while, but Rebels finally did what it always said it was going to do.